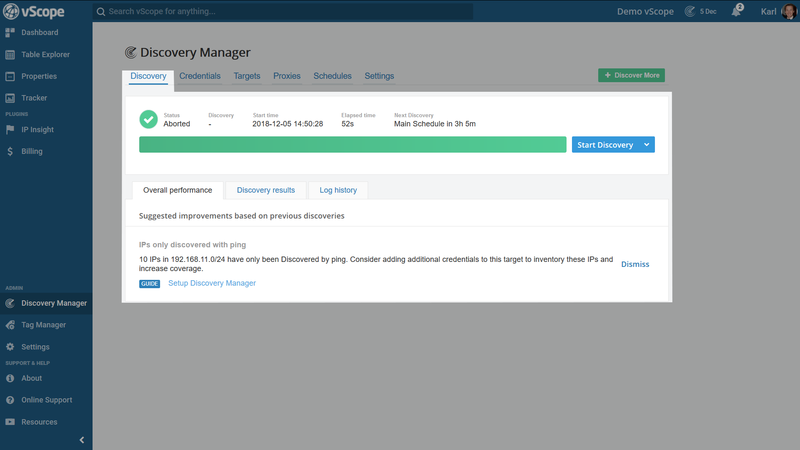 Discovery Manager manages vScope’s inventory. This is where to set up what to discover, when to discover it and improve the overall inventory coverage. 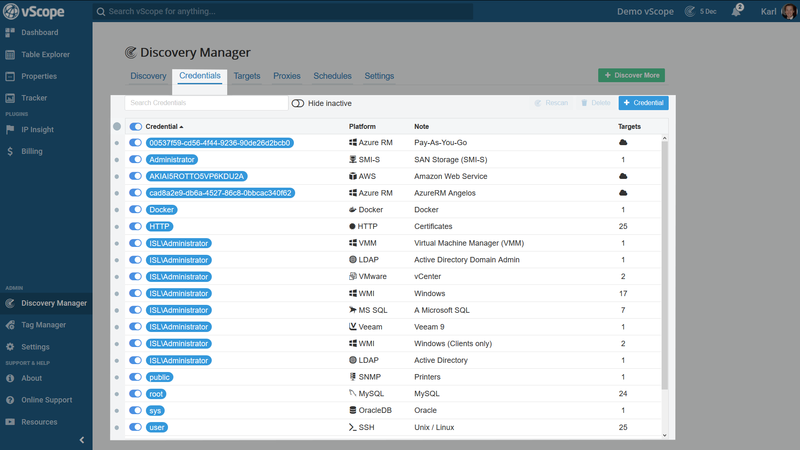 Discovery Manager consists of five main sections plus one setup wizard. 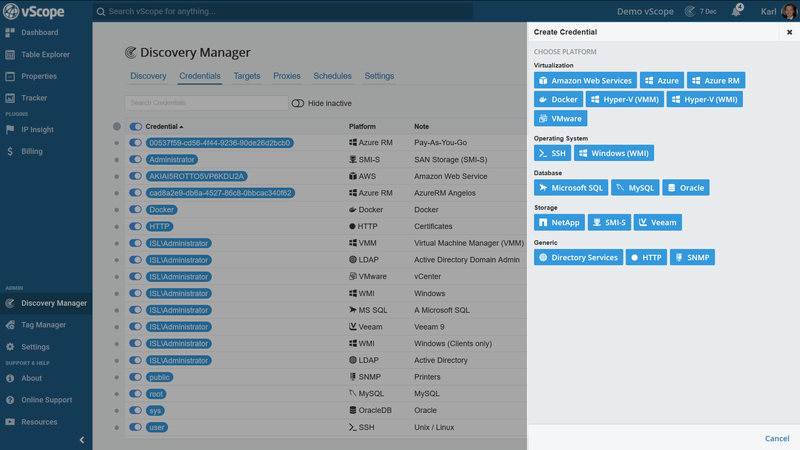 NOTICE – To access Discovery Manager a user needs to be an Admin in vScope. The Discovery tab is where the overview and results from Discoveries. It is also possible to manually trigger a Discovery from here. In this tab there are three sub tabs that provides additional information about the Discovery performance. The overall performance suggests improvements to the discovery. 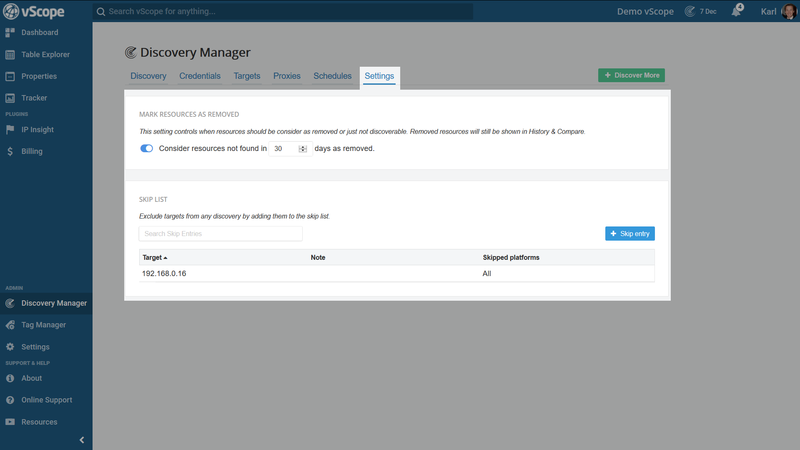 The improvements ranges from speeding up the Discovery by removing certain targets, to better coverage of IT resources. The Discovery Results tab shows the results from the most recent Discoveries. It is possible to filter on the different results to see what was successful, if there were any errors or no results from the discovery. During a running discovery there is an option to toggle whether to view current progress or not. By using this information it is possible to troubleshoot and inspect potential misconfigurations. 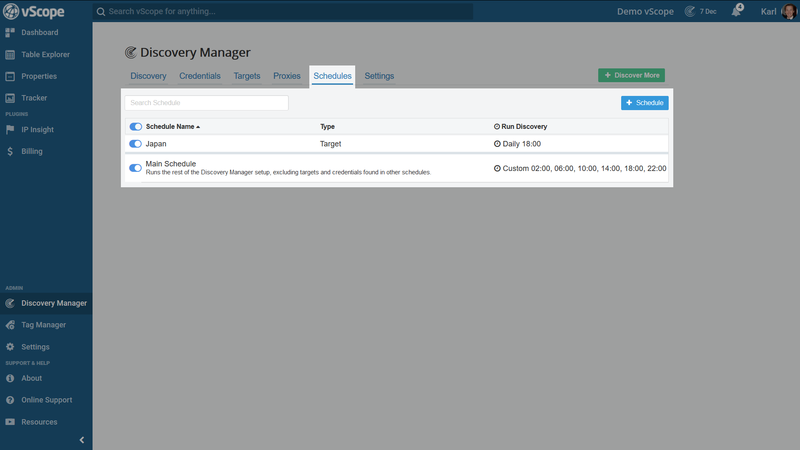 Here it is possible to view a detailed log of the Discovery. Log history it is the detailed logs library from the latest Discoveries. 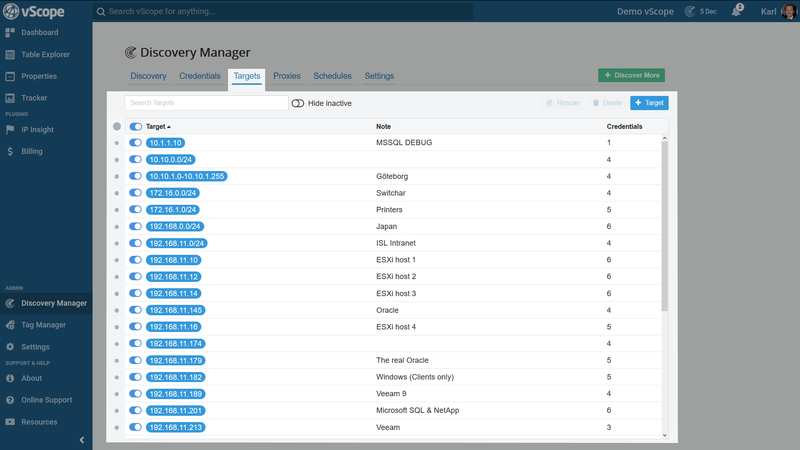 Manage the credentials used to discovery information in the Credential tab. From here it is possible to can add, edit or delete credentials. Notice that each type of credential requires a different kind of information. Credentials are ASSIGNED to targets. The fourth column highlights how many targets a credential has assigned. Click on the “+ Credential” to add a credential. 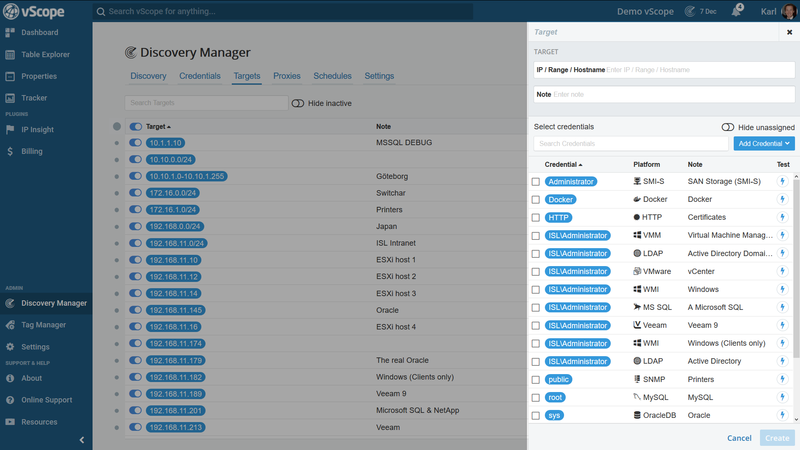 Select what platform to add, input information and the select what targets to use with the credential. It is possible to edit the credentials by clicking on it. For example, one may want to update the credential with a new password information. 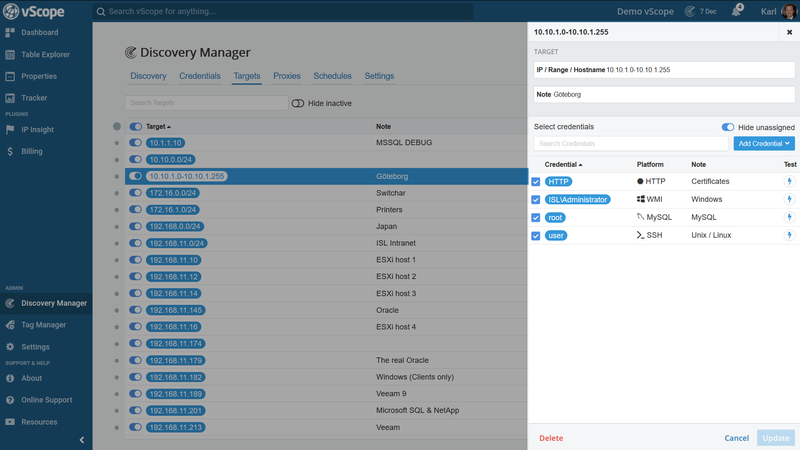 Targets in vScope are IPs, hostnames, ranges or cloud portals to which are aimed (assigned) to Credentials. A range is a scope of IP addresses, a way to shortcut many single IP targets. Virtualization hosts or domain controllers would probably use single targets but for larger server or printer networks we suggest to use IP ranges instead. 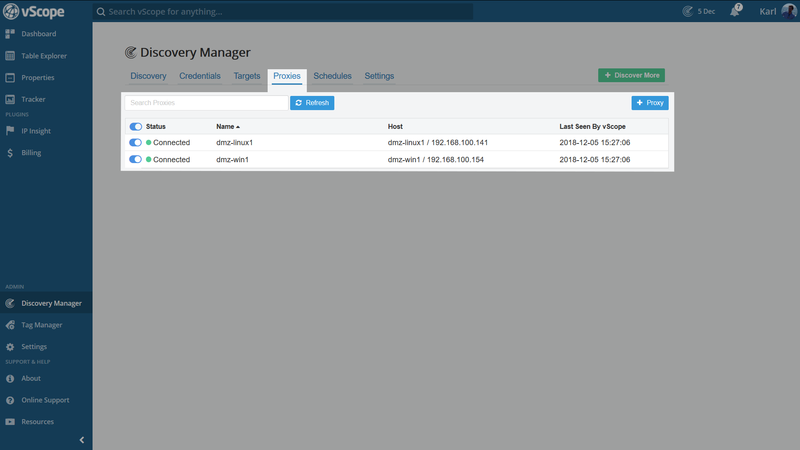 Targets are by default inventoried from the vScope server, but it is possible to assign targets to Proxies (See 2.5.) and have them inventoried from another machine, e.g. a DMZ. Click the blue “+Target” button to add a target. Specify an IP/hostname/range and add a note (optional) about the target. 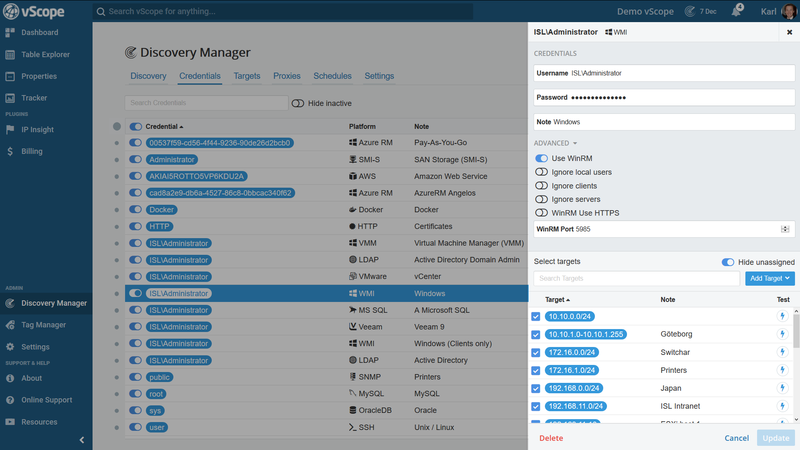 Choose whether to use an existing Credential in vScope with the Target or add a new one. Edit a target by clicking on it. Change the IP-range, add a note or assign a new credential to the target. Smart Targets are found under the Targets tab. They are highlighted green and grouped depending on platform. They are easy to use. Simply assign a credential to the target (of the correct credential type). 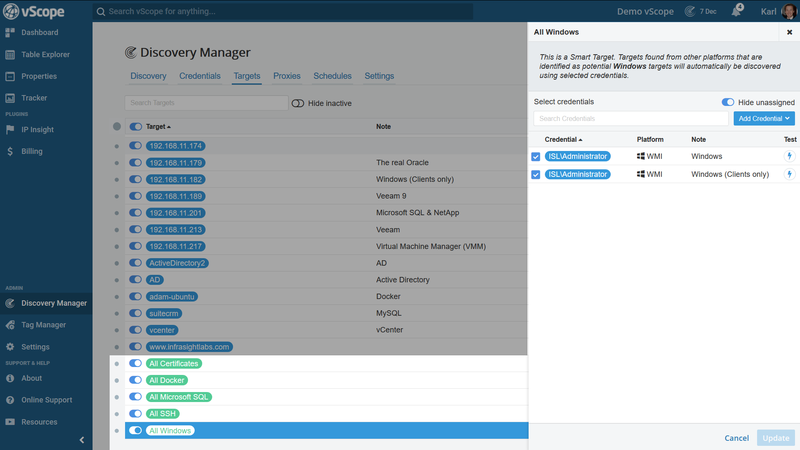 Just remember that it is necessary to add either an AD/LDAP or VMware/WMI credential to find any Smart Targets from other platforms. Take note of the “Hide unassigned” toggle button which by defaults is hiding all credentials that are not in use. Proxies are used to do discoveries in networks where the vScope server might not have full access, such as a DMZ or a customer’s network. Proxies are also beneficial for discoveries of remote networks. vScope proxies communicate with the main vScope over one single port. Learn how to add proxies. A Schedule is a way to configure: what resources shall be inventoried and when. Adding multiple Schedules allows for discovery of information from different parts of the network at different times and intervals. Perfect for remote branches, closed networks or keeping information from some platforms up-to-date more frequently. 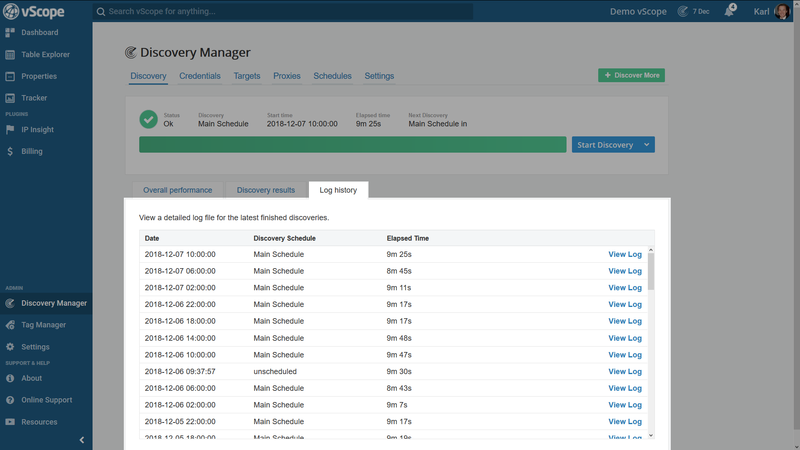 The Schedules tab is where one adds and manages Discovery schedules to run. By default there is only have one schedule – a Main Schedule. 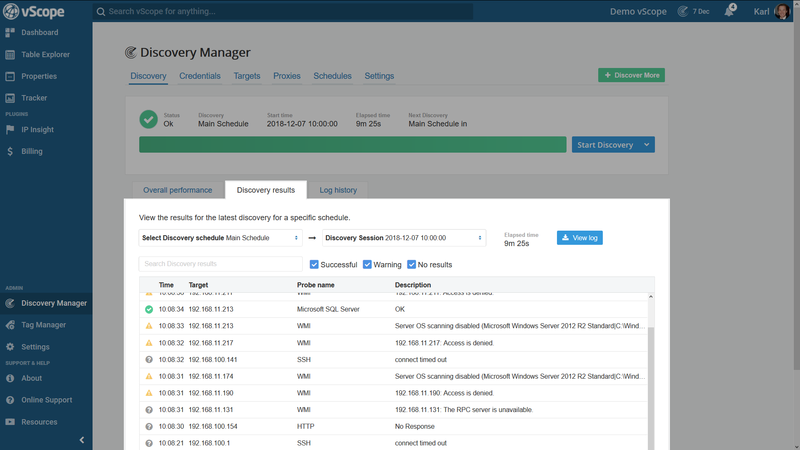 The Main Schedule discovers, by default, all credentials and targets that have been added (and enabled) to Discovery Manager. Once more schedules are added these credentials/targets are subtracted from the Main Schedule. Select when and how often the Main Schedule should run by clicking on it. The Settings tab allows for to customization of the Discovery. Eg. when to mark resources as removed. Use the skip list if there are resources on target ranges vScope’s not supposed to inventory. Back to the User Guide.